Our second time with Rosi and Carmello, probably the two most hospital people in Varese ! We stayed 4 nigthts, in their beautifull old Italian villa, guarded by the friendly dog Heidi. Excellent breakfast with fresh fruit, different sorts of bread, cheese and other Italian first class products. But, best of all ; Carmello's coffee ! Good, large room with balkon and everthing you need in a clean bathroom. Excellent location between Como and Lago Maggiore. Beautiful room, spotless, decent size, good bathroom, comfortable bed. The owners are excellent hosts and breakfast is very good (fresh fruits, juices, croissants, coffee, tea, etc. etc.). Good location and (safe) parking on premises. City centre 3 km away, house is located on main road. Price-quality is very good. Free wifi (and working). Il Giglio e la Rosa, Varese. Warm welcome and very comfortable large room. Clean bathroom with everything one needs. A very good abundant breakfast. We would have liked some mineral water in the bedroom. Our only niggle was with the light shining through the glass fronted bedroom door from the upstairs passage. The door curtains could not keep the light out. A perfect place for a delightful holiday in a friendly and family atmosphere with a superlative, extremely kind and professional service. Just a few minutes from Varese CBD. The owners went to extreme length to help us with our 22 months old grand daughter. Great food an quiet rooms. Friendly, homely, comfortable... the perfect retreat, and an easy bus ride to the centre. A warm greeting from the owners, who made me feel instantly at home. 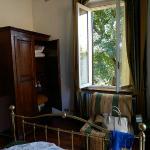 This lovely B&B has the personal touch, and feels like a real family run, italian experience. The rooms are comfortable, lovingly decorated and spacious.... and the breakfast room is welcoming and homely. An easy bus ride to the centre of Varese, and an easy drive to the beautiful lakes... this makes an excellent base for any traveller. I will be returning as soon as I can, and am looking forward to seeing the owners again!